﻿﻿Holy Cannoli was born as an idea by long-time Italian baker and owner of Bona Via Bakery, Nicola Chiaravalloti back in 1985 when the family first opened its bakery in Scarborough, Ontario. Nicola developed the now famous Ricotta recipe after a trip to Sicily many years ago. Since then, these Cannoli have been met with a cheerful "these are the best Cannoli I ever had!" exclamation from many friends, family and clients. 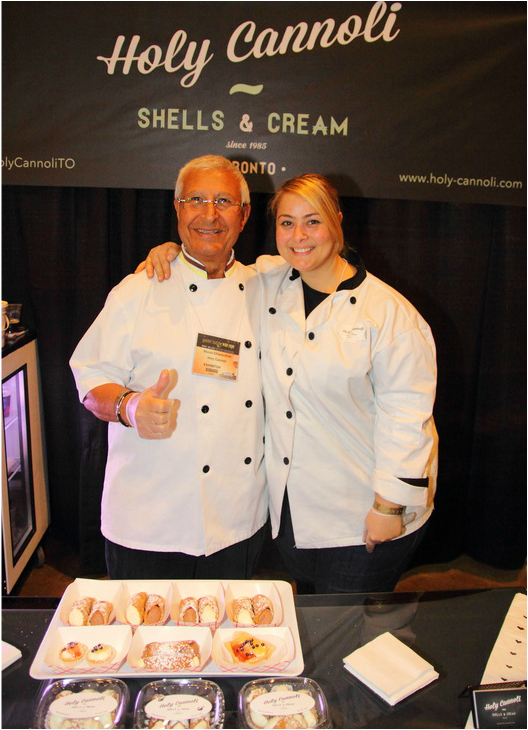 In 2013, Nicola's daughter Vanessa Chiara decided to take the mouth-watering Cannoli Cream recipe and expand the product into a business and a brand - launching in September 2014 with their debut at Canada's Baking and Sweets Show. Holy Cannoli can now be found at many GTA retailer partners as well as appearing at numerous Food shows, markets and private events throughout the year. In February 2018, we sadly had to say goodby to Nicola. He was our mentor, Grand Pubbah and one of the best Pastry Chefs to ever grace the Toronto bakery landscape. Nicola influenced many bakers and pastry chefs including our sisters at Cakestar and of course ourselves and he is sorely missed each an every day. Holy Cannoli Toronto will continue in Nicola's footsteps and is currently working on expanding through new retailers and more markets in the coming year. Nicola Chiaravalloti and Vanessa Chiara at the Gourmet Food and Wine Expo, November, 2014.